My younger brother is applying for his first college job. He is really comfortable with design software, but his portfolio is pretty lacking. He reached out to me for help, and I thought it might be worthwhile to share this advice with my blog readers as well. The first time I made my graphic design "portfolio" (I’m using quotation marks because it wasn't even a real portfolio, looking back on it), I had NO idea what I was doing. There are so many things that seem common sense to me now, but they were really hard for me to figure out and I wish someone had just told me that you shouldn't put your portfolio in a Lisa Frank™ binder ! Let me be your guide in creating a graphic design portfolio that really works. Don't make the same mistakes I did. Good: Printing your portfolio at home and putting it in a binder. Better: Sending your portfolio to a professional printer and having it bound. Best: Creating a digital PDF or website for your portfolio that you can send in an email. When I got my first job as a graphic designer at Brigham Young University, I really didn't have a great design portfolio. I had created posters and invitations for family and friends, but I really didn't have any "name brand" clients, because I had never really been paid for my work. That's OK. Even the most basic portfolio can show your style, organization, and most importantly, your potential. Collect all the design work you've ever done. Organize your projects by category. Put each project into a category. You might have, "Branding" for logo designs, "Print work" for posters and invitations, and "Apparel" for t-shirts. Seeing the different categories (and how much is in each category) gives you a good idea of what your strengths and weaknesses are. Select your best work to showcase. I know when you don't have a lot of work, it can be scary to take something out. But the truth is, you are better off to have 3 good pieces than to have 10 mediocre pieces. And you're better off having 3 mediocre pieces than 10 terrible pieces! (3-5 is probably a solid number for beginning portfolios). If you really don't have enough work in your portfolio, look at step 4. If you have time, make something new. I hesitate to add this suggestion because if you're reading this blog post, you're the type of person who wants to have an amazing portfolio right off the bat. I have been But the fact is, if you haven't have a paying job as a designer of some sort, you're not going to have 100% top quality professional work. That's OK. This portfolio is just the vehicle to getting you a job. It will grow and evolve over time. So don't worry too much about adding new pieces if you're just trying to get your work out the door and into the hands of an employer. This is the part of a creative portfolio that most people miss, and this is what will get you hired! Once you have your projects organized by category, you’re going to do a little writing. Each project needs a title and a short explanation. You want to demonstrate your ability to understand a brand and solve problems with design. One way to do this is to imagine that you’re explaining each project to your mom, or someone who doesn’t know a lot about graphic design. 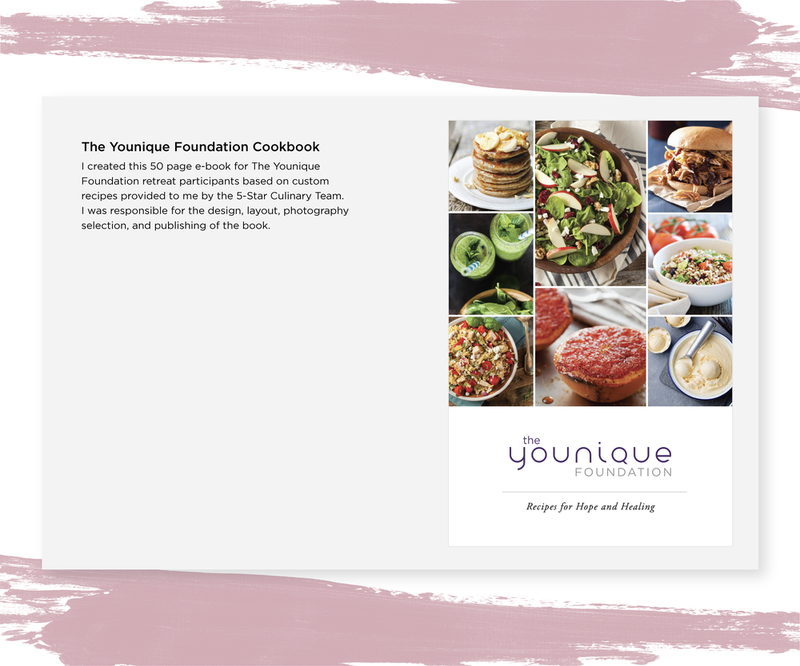 (Description) I created this 50 page e-book for The Younique Foundation retreat participants based on custom recipes provided to me by the 5-Star Culinary Team. I was responsible for the design, layout, photography selection, and publishing of the book. I created an example below that I hope will help. Tip: If you are the kind of person who doodles or sketches things out, I would absolutely include a section in the back called "The Creative Process" or something cheesy like that. People LOVE to see how your ideas went from your brain to your pencil to your portfolio. Plus, it's a great way to add some bulk to your portfolio without having to polish a whole project. This is probably the part you are wondering about the most. Some jobs will let you upload your portfolio online the same way you upload your resume. If this is the case, you will want to have a digital/electronic portfolio, AKA a PDF file. When I have all my projects collected, organized by category, and displayed on a page with their description, I count them off, and then I make an Adobe Illustrator document with that many pages, plus one for the cover, one for the table of contents, and one for the back. So if I have ten projects, I would make an Illustrator document with 13 pages. Then I just place each of my projects on a separate page. I honestly don't know why this is a thing, but professional designers ALWAYS put their portfolio on 11x17 pages in the landscape (hamburger) orientation. It might not make very much sense but trust me, if you put your portfolio on an 8x11 portrait page, you are going to look like a total rookie. Once your portfolio is all together, you just save as a PDF and Voila! You're done! Tip: If you're uploading or emailing your resume, you'll want it to be a reasonable size, somewhere around 10mb. That can be hard to do when you have so many pictures and high resolution files, so if your file is just huge, just google "compress pdf file size" and there are a million online services that will shrink your pdf without ruining your files. The one I use the most is called "Small PDF." Don't save or send or print ANYTHING until you have checked for typos so many times that you feel like your head is going to explode. Have your mom read it; read it out loud, do whatever you have to do to make sure you don't put all this work into a portfolio just to look like an idiot when you send it to someone. Once you have your PDF all nice and neat, you can and should make a physical copy of it. Take the file to FedEx/Kinkos Office and have it printed. Don't print it on glossy paper, that's what amateurs do. Professionals always use MATTE paper. Get the whole thing bound on the left side and then you're done! I like to put clear covers on the front and back of my portfolio but I know a lot of designers don't like that, so just use your judgment. I find that employers really go crazy for a matching resume and portfolio. Use the same font, make the same header, whatever you want, just create a “brand” for yourself! I hope this helps you create a graphic design portfolio that you’re proud of! If I could give you one last piece of advice, it would be to spend less time agonizing over your portfolio and more time actually applying for jobs. If you organize your work, write descriptions, and format it correctly, you’ll get hired in no time. Update: This blog post has been extremely popular over the years. I’m grateful I could help so many of you create design portfolios that showcase your skills and potentially find work as a designer! If you’re interested in supporting my work, please consider saving one of these images to Pinterest or leaving me a comment. Thanks!